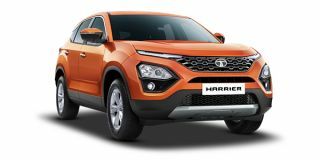 Tata Harrier price starts at Rs.12.69 lakh (Ex-Showroom, Delhi) and the top end variant Tata Harrier XZ is priced at Rs. 16.25 lakh (Ex-Showroom, Delhi). The Tata Harrier is available with a single 2.0-litre diesel engine. This motor is the same as the Jeep Compass, but with a different engine map. Instead of the Jeep’s 173PS/350Nm, the Harrier gets 140PS and 350Nm. At launch, the Harrier will be offered with a manual transmission only. A diesel-automatic Harrier is in the works and is expected to be launched by Diwali 2019. What’s surprising is that the Harrier is front-wheel drive despite it being based on the Land Rover Discovery Sport’s platform. It does get an ESP-based ‘Terrain Response’ system though, with Normal, Rough Road an d Wet modes. This is in addition to the Eco, City and Sport drive modes. Q. Can I buy Harrier or wait for sunroof version? Q. What is the turning radius? Q. What is new in this car?